"Can I swim with micro link hair extensions?" We think micro link hair extensions (also called micro loop hair extensions or micro bead hair extension) are great. No glue or heat used to attach the hair extensions means they're kinder to your hair, but what about swimming? Or sports? Or exercise? Or much loved sun beds? Read on and you'll be in the know. Yes you can swim with micro ring hair extensions, although it's better for the hair extensions if you don't. brush the hair first then plait (braid) the hair, or tie it in a high bun to reduce the likelihood of tangling; this applies to straight texture micro ring hair extensions as well as wavy textured micro ring hair extensions and curly texture micro ring hair extensions. if possible try to avoid your head being underneath the water. Chlorine in swimming pools and salt in open water can cause the hair to matt together. Both these elements can affect the (stick-tip keratin) bonds if not washed off. The bonds can weaken, disintegrate, become sticky and loosen; this could cause the extension hair to become matted with your hair or slip off. Chlorine can also alter the colour of the hair extensions. After swimming, detangle the hair using your fingers. Start at the ends of the hair and work your way towards the micro rings. Don’t pull or tug at any knots as you don’t want any of the micro links to come loose; don't comb the hair extensions when wet. Once the hair extensions have been detangled wash your micro loop hair extensions and use a leave-in conditioner on the hair from mid-length down to the ends (don't put leave-in conditioner on near the micro links as this can affect stick-tip (I-tip) keratin bonds). The leave-in conditioner will help repair and strengthen the hair after exposure to chlorine or salt. Make sure that the hair is micro link hair extensions have dried fully after swimming and washing and allow the hair to rest for 24 hours before using any heat styling tools on your micro link hair extensions. "Can I go to the gym with micro link hair extensions?" You can still go to the gym and play sports and run after children with micro link hair extensions. Wash the hair afterwards to prevent the micro links from becoming loose or slipping down your hair. The salt in perspiration has the same effect as salt in the sea - if it's not washed off, it will react with the keratin bonds causing them to weaken or become sticky and loose (which means they could fall out). As micro rings can contain metal, they can react with chemicals (salt and chlorine) which is why washing your hair extensions is as much about cleaning the hair as it is preserving your micro ring hair extensions. However you choose to style your hair extensions after washing and drying, keep any styling products away from the micro rings (bonds) as these could damage the bonds and cause the micro rings to slip off your hair. Whenever you've undertaken any activity that could have caused lots of movement at the roots of your hair (like dancing or swimming) always take the time to slowly and gently run your fingers across each of the micro rings to make sure that they haven't become tangled and if necessary gently comb the hair extensions to remove any knots. 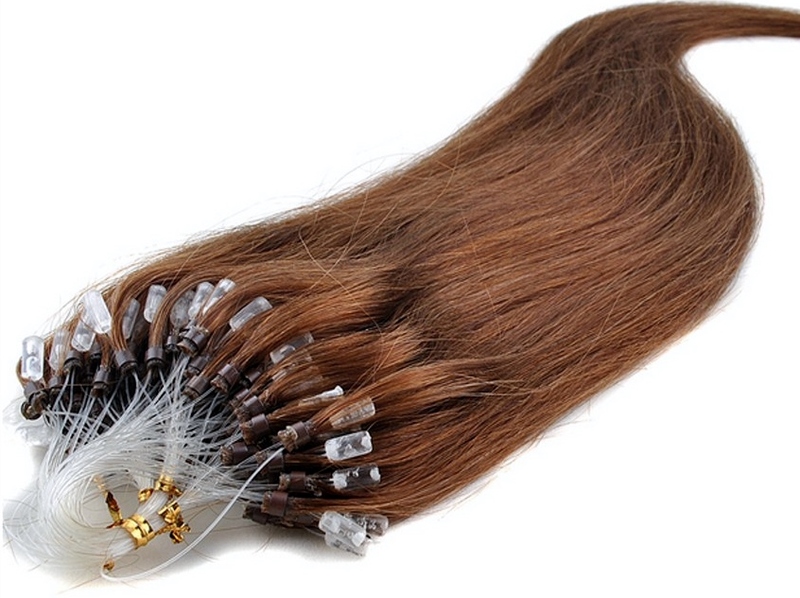 At the end of each day, prepare your micro link hair extensions for sleep so that they don't become tangled overnight.